I spent Monday and much of Tuesday suffering from toothache, but luckily my dentist gave me an immediate appointment and amoxicillin is very effective. As soon as I started to feel better, it occurred to me to wonder just why toothache is so painful. Okay, it's dangerous, but there are many other conditions that are much worse, up to and including 100% fatal, and hurt much less. Why should that be? I looked around a bit on the web without finding anything useful.So here's a theory that I'd like to run by you. From the point of view of evolutionary psychology, a natural question is what selection advantage there might be to having toothache be so painful. And in fact there is a plausible candidate! Toothache, I argue, is unusual in the following respect: a) it is fairly dangerous, and b) it is often easily treatable by simply removing the offending tooth. People have known how to remove teeth for a long time, plausibly far longer than recorded history.Given these facts, it seems to me that there might well be a positive selection pressure towards experiencing toothache as very painful. The wusses like me will moan and complain about how horrible it is until the people around them can't take any more, and just have to do something to stop it. In contrast, some of the strong, silent types who clench their manly jaws and block out the pain will get blood poisoning and die. Even if this only happens to a modest proportion of the strong, silent types, it's pretty clear which strategy is going to win.Is there any prediction made by the theory which would allow us to test it? Again, to my surprise, the answer is yes. Hardly any animals except humans are smart enough to be able to remove teeth (in fact, I am not sure any animals are that smart), so there should be no corresponding selection pressure. Hence other animals should not experience toothache as being equally painful.Is this true? I'm not sure. A little googling confirms that humans are far from being the only species that suffers from toothache - for example, it's claimed to be a common problem for elderly dogs. But I have spent a reasonable amount of time in the company of elderly dogs, and I've never seen one display the symptoms that in a human would suggest a toothache. Dogs are pretty good at conveying emotion, so I would thought it'd be noticeable. On the other hand, maybe I'm just not enough of a dog person to pick up the cues. I know even less about horses.Does anyone in the amazing Goodreads hive mind have more information? 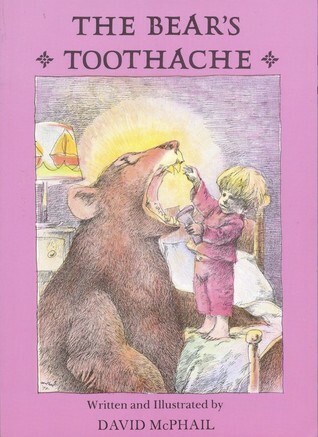 The Bear's Toothache will charm children and their adults! I fuels imagination and has the lovliest illustrations. Summary: This is a book about a boy who allows a bear to come in his window because it had a toothache. The boy tries many times to pull the tooth so the bear feels better. Eventually they decide to tie a rope to it have have him jomp out the window and it works!Audience: - Reading level- Early- Genre- Fiction - Topic- bears, pulling teeth Curricular uses: Independent reading- Could be read by a student who is dealing with loosing their own baby teeth. The book is able to be read through the images and there are a lot of sight words. Social Issues: sneaking things into the boys bedroom, hiding the bear from his dadLiterary elements: man vs. himself conflict between the bear and his stubborn tooth, boy is very couragous and complex in the fact that he is very brave about taking care of a bear that is so largeInteractions and counteractions of text and image: The images are very amusing and interact with the text. By looking at the images, the reader will learn more about the story that the text does not tell. My favorite image is of when the dad comes into the room after hearing noises. The bear is standing tall against the wall tring to go unnoticed and then under the bed lifting it in the air and the dad does not notice! McPhail, David. "The Bear's Toothache." Little, Brown Books for Young Readers, 1972. Print. This is the story of a young kid who hears a bear hurting outside his window late at night. The boy finds out the bear has a toothache, and so he comes up with many ways to try and help the bear. Eventually, they are able to pull the bear's tooth by having him jump out the window with his tooth attached to a rope and the bed. The bear thankfully gives his tooth to the boy to put under his pillow. This book was very well written. The text was separated from the pictures at the bottom, but the pictures beautifully illustrated the actual happenings of the text. There was just a small amount of simple text with simple illustrations. This was meant for a young child and easy reader. I would definitely use this book to help kids think of creative ways to solve problems in their own lives. Summary: This book is about a bear that creeps into a boy’s window. The boy is trying to relieve the pears pain. The bear has a terrible tooth ache. The boy tries hitting him with a pillow and many other things.I like the book it is engaging to children into the tooth ache. This book is appropriate for first graders. Literature Terms: Onomatopoeia, Plot.This book is great to teach first graders how sounds are related to their meaning. Response: I lived the book. It’s a great book for emerging readers to read during their independent time. Activity: This is a great book to create a readers theater. It has been years since we read this book, but the memory is very fresh -- the page with the exhausted dad, bleary-eyed in doorway, not noticing the bear hiding under the bed in particular. Also the way Nick and Kagan's excited toddler-speak, recounting the story, would give way to perfect English with "The tooth popped out! ", which always surprised the random adults they would accost. Lovely. David McPhail writes the most wonderful stories for children. This is one of those perfectly constructed picture books with humor, ingenuity and a perfect ending. Loved it! 2008-Okay, good to use for younger children and talking about predictions." This was one of my favorite books when I was a kid! One of the few I can remember reading over and over again. This is a very short book for young children. A clever and sweet little problem solving story although I hope no kids are inspired to pull their own teeth by jumping out of a window!! All David McPhail books are delights for kids and adults. The illustrations are magical. The book was a fun story about a bear and a boy. It was interesting to see how the boy used problem solving to help the bear with his toothache.